The World is a ship serving as a residential community owned by its residents. The residents, from about 40 different countries, live on board as the ship slowly circumnavigates the globe — staying in most ports from 2 to 5 days. Some residents live on board full time while others visit their floating home periodically throughout the year. It is operated by ResidenSea, headquartered in Miramar, Florida. At one time ResidenSea's headquarters were in unincorporated Miami-Dade County. The World flies a Bahamas flag and has a gross tonnage of 43,524 tons. The vessel is 644 feet (196 m) long, 98 feet (30 m) wide, and has a 22-foot (6.7 m) draft, 12 decks, and a maximum speed of 18.5 knots (34.3 km/h). The crew numbers 250. The ship has 165 residential units (106 apartments, 19 studio apartments, and 40 studios), all owned by the ship's residents. The ship carries between 100 and 300 residents and their guests. The World was the idea of Knut U. Kloster Jr., whose family had a long history in the cruise ship industry. The ship was built in Rissa, Norway, by Fosen Mek. Verksteder A/S, and launched in March 2002. ResidenSea in Miramar, Florida, remained the management company responsible for operations and administration of the ship, including hiring the hundreds of employees that offer services such as housekeeping, beauty treatments, photography and other amenities. 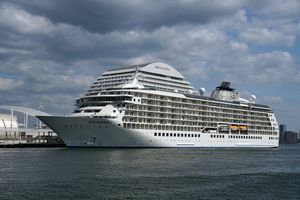 The residents, through their elected board of directors and a network of committees, provide guidance to the management about the ship's itinerary, finances and lifestyle. 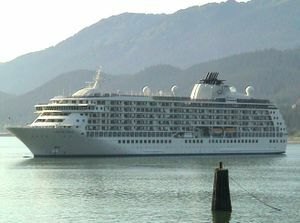 The World has facilities similar to those on board a regular cruise ship, and also some that are unique due to its residential nature. They include a small grocery store and delicatessen, a boutique, athletic facilities that include a golf simulator, putting green, casino, full-sized tennis court, jogging track and gym. There are five restaurants that supplement the full kitchens in all apartments and dining ashore. For on-board entertainment there is a movie theatre, library and music performances. 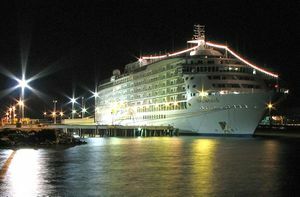 In addition to shore excursions, classes have been offered on board in topics such as dance, navigation, language, cooking, arts and crafts, music, computers, and photography. The World provides Internet access in each residence. ↑ Contact Us. The World. Retrieved on January 20, 2010. ↑ Welcome to ResidenSea. ResidenSea. January 18, 2006. Retrieved on January 20, 2010. 27 July 2010, The World entered Dartmouth harbour in Devon, coming in astern. She came into harbour starting at around 07:15BST and was moored with single lines by 07:50BST. The attending tug had no work to do. the line was slack throughout the manoeuvre. There is a growing collection of videos of The World including the example below at her video page. This page was last edited on 12 August 2010, at 20:59.